IBASSIN: Nick Thliveros Wins 2019 Costa FLW Series Southeastern Division on Lake Okeechobee with 46-01lbs! Nick Thliveros Wins 2019 Costa FLW Series Southeastern Division on Lake Okeechobee with 46-01lbs! Thliveros 2.0 first FLW win! Thliveros Big O win a family affair. 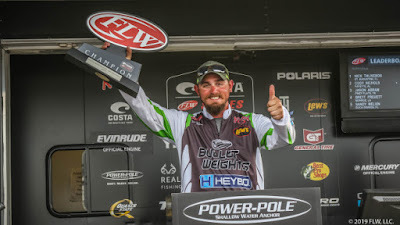 Nick Thliveros earned the first win of his FLW career. He was a co-angler at the time, though getting that first trophy and check helped reinforce his desires to move to the front of the boat. In 2016, he committed to that dream, and now in his fourth year as a pro fishing the Costa FLW Series, Thliveros has a second win under his belt – this one from the front of the boat at the 2019 season opener for the Southeastern Division on Lake Okeechobee. Heading into the final day of the tournament, which was presented by Power-Pole, Thliveros clung to what would normally be considered a small lead on Okeechobee – just 4 pounds, 7 ounces – and figured he needed to catch a solid bag to have a shot to win. In fact, most pros had high hopes for big weights on the final day. However, the fishing didn’t quite live up to the hype, and Thliveros’ 10-15 catch was more than enough to lock up the W and earn a check worth $54,000. The key for Thliveros was to take advantage of the conditions the lake presented: cool, dirty and low water. He took his search outside the main body of the lake and settled on a canal area between Henry Creek and J&S. The canal system produced some good fish, but it was a key bite on day two that really gave him confidence to keep doing it. Later on day two, Thliveros caught another solid fish back near Clewiston while cranking a rock spot that is part of the original rock from the rim ditch. Those clutch bites put him up to the 19-pound range and ultimately would help give him the win. Cranking rock got him to day three, but that bite was fading as warmer weather finally got the bass out of their funk and thinking about spawning. That’s when Thliveros made the best decision of his career. At 10:45 Thliveros scrapped the plan that got him to the final round and ran to the Monkey Box to a place fellow competitors and friends Darrell Davis and Tim Frederick had told him about. It was a shallow area where fish were setting up to spawn, and Thliveros figured worse case he could scrounge up a few 2-pounders to save the day. It worked. Thliveros cranked a Lucky Craft silent square-bill. There was a fair amount of people fishing where he was the first two days, and he believes the silent crankbait got him a few more bites. He also used a 7.1:1 gear ratio reel, which allowed him to run the trolling motor at a higher speed and still crank efficiently, but also get a better reaction bite when he slowed down in an area. Today, he relied on a Nichols jig with a blue bug-colored Strike King Rage Craw and a Texas-rigged black, blue and silver-colored Bitters Salty Sling with a 1/32-ounce Bullet Weights tungsten weight to catch his fish. While the money is a nice perk that goes along with the win, for Thliveros there’s so much more to it. The son of legendary FLW Tour pro Peter T, Nick says having his dad compete in the tournament and be there alongside him during weigh-in was better than any amount of money. “The fact is that my dad is my mentor and my hero,” Nick says. “He has as many hours on the water as anyone who chases bass. To be able to finally put it together and win with him here is a special moment. I’ve always wanted to win as a pro with him here. I take a lot of pride in it, and I see it as a bit of a passing of the torch in a way.